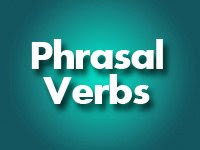 Let's take a look at some phrasal verbs using the verb "To Be"
I'm going to Madird this Summer. I'll be over at my parents's house. Voy a ir a Madrid este verano. Me voy a quedar en lo de mis padres. I have to be home before dinner, so I'll be off soon. Tengo que estar en casa antes de la cena, así que me iré pronto. The game was off due to bad weather. El partido se canceló a causa de mal tiempo. My girlfriend is off from work at 5 p.m.
Mi novia termina de trabajar a las 17.00. This milk is off, look, it's rancid. La leche se echó a perder, mira, está rancia. My brother is down with a sore throat, so he will have to stay in bed. Mi hermano tiene angina, así que tendrá que hacer reposo. Bill is not in town. She is away for this month. Bill no están en la ciudad; va a estar afuera por esta mes.